Last week I created an inspiration board for a Super Bowl party and included cupcakes from the "Hello, Cupcake" cookbook. Yesterday a group of us from our condo building got together for a Super Bowl party and each of us were responsible for bringing something to eat or drink. My neighbors know their way around the kitchen and the spread was incredible and oh-so delicious. I'm so sorry I didn't get pictures, but I got distracted by the good company and game itself and by the time I remembered, it was too picked over. I couldn't find Marshmallow cookies or vanilla taffie (well, to be honest, we went to one grocery store that didn't have them and instead of going somewhere else, I decided to improvise) so I used Snackwell Angel Food Cake cookies which were a tad too big but overall were fine. Use less taffie than you think you need to make the footballs. I made the corners of the footballs too big and they kept falling off or sagging even after I used frosting to stick them together and after they were in the freezer. Like I said before, I've never baked anything that has a great deal of assembly after your done baking, so I didn't have any of the necessary pastry tools. The seems on the footballs were incredibly difficult to do without any tool and I had to try to do it by hand with a frosting tube that I got at the grocery store. It came out looking much more homemade than I would have liked (my OCD was in overdrive when I was trying to do this) so maybe a trip to Michael's to invest in some pastry supplies may be necessary. As a final side note, I will also point out that these may have been a little too fancy for a group of guys wanting to watch football. Because there are so many elements on top of the cupcake they can be cumbersome to eat. 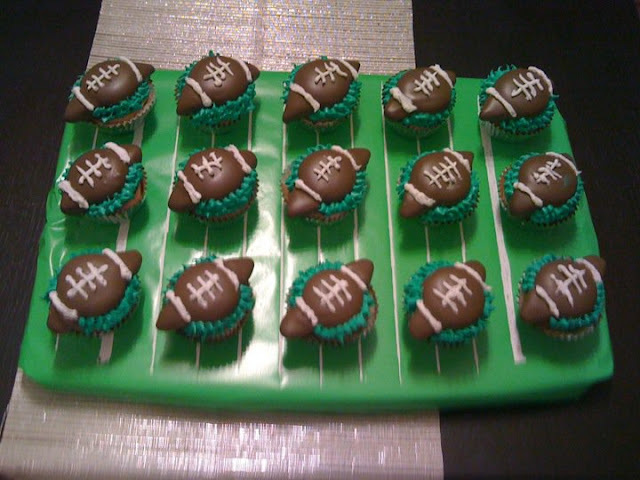 Under normal circumstances, I don't think it would have been a big deal to eat them, but when you're with a crowd that is interested in beer, chili, ribs, and strombolis...cupcakes with Snackwell and taffie made footballs are not fully understood. I'd definitely like to do something like this again, but I'll save it for a different party in the future. I forgot the golden rule of entertaining...KNOW YOUR AUDIENCE. Also, if anyone is interested, there was a ton of great food last night but one of my neighbors made one of the best artichokes dips I've ever had. You can find that recipe on Closet Cooking's blog.